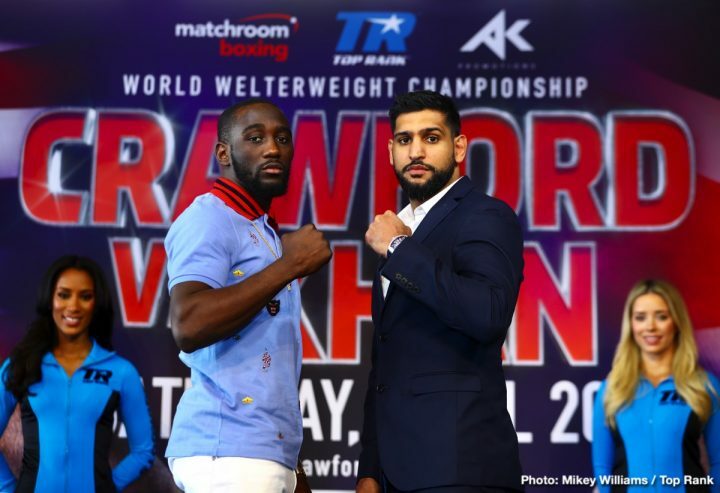 By Sean Jones: Top Rank promoter Bob Arum is predicting huge pay-per-view numbers for WBO welterweight champion Terence Crawford’s title defense against Amir ‘King’ Khan on April 20 on ESPN PPV. Arum, who heads Top Rank Boxing, is predicting the Crawford-Khan fight will do more than 1 million PPV buys in the U.S. on April 20. That’s a highly ambitious figure that Arum is predicting, since Crawford is not a PPV fighter, and Khan has only once been involved in a PPV fight in the U.S and that was against Saul Canelo Alvarez in 2016. That fight brought in only 600,000 buys on HBO PPV. Canelo is arguably a lot more popular in the U.S than Crawford. The boxing fans that remembered how Canelo knocked Khan out cold in round six, they’re probably not going to want to order Crawford-Khan after seeing that fight. Khan hurt his career not only by getting knocked out, but by disappearing from the sport for two years after the defeat to Alvarez. Khan didn’t fight again until 2018. That’s not the best way for a fighter to come back from a knockout by staying out of the ring for 2 years. With many boxing fans streaming PPV events on the Internet nowadays, it’s hard to imagine the Crawford vs. Khan fight bringing in 1 million buys on ESPN PPV. Whatever buys the Crawford-Khan fight does do, you have to assume that it’ll bring in at least the same amount if not more views from illegal streams. That’s a lot of lost revenue. Arum still hasn’t found a venue for the Crawford vs. Khan fight, but it’s possible that it’ll wind up in New York rather than Las Vegas, Nevada. READ Brook: "Khan will want to fight me now"
A better prediction by Arum would be between 150,000 to 300,000 pay-per-view buys for the Crawford vs. Khan fight. Those aren’t bad numbers for two guys that lack fans. Deontay Wilder vs. Tyson Fury is said to have done a little over 300,000 PPV buys on SHOWTIME, and that was a far better fight than Crawford-Khan, which shapes up to be a mismatch in favor of Crawford. If Wilder-Fury brought in only 300,000+ PPV buys, then it’s easy to forecast Khan-Crawford doing below those numbers, even with ESPN’s mega-phone. Just putting lackluster fights on PPV and hoping the boxing fans will happiliy purchase them is a misguided idea. You’ve got to give the fans a good fight for them to want to pay their hard-earned money by ordering it. The basic problem Top Rank has is there’s guesswork involved with the outcome of the Crawford vs. Khan fight. The fans already know Crawford is going to win by a knockout, so it’s not a fight where people feel compelled to want to order it. It’s handy to have ESPN as the mega-phone for Top Rank’s fights, but Crawford vs. Khan is such a bad fight in terms of appeal, that it might not matter that ESPN is a superb mega-phone to let the casual boxing fans know about fights. You’ve got to have a good product to get fans interested enough to want to shell out $75 for PPV. “As soon as we got to ESPN, we started doubling and tripling what are ratings were before [at HBO], and that was no accident, and it wasn’t because we were necessarily better” Arum said. “It was because we were on a platform that had a huge mega-phone. The important part of promoting boxing is you have to have a mega-phone. That’s the problem DAZN has. They’re distributing good fights, and Eddie [Hearn] is a good promoter, but he has no mega-phone here in the United States because he doesn’t have a linear outlet like ESPN,” Arum said. What may ultimately keep the Crawford-Khan PPV numbers far below Arum’s projections is the basic reality that Crawford isn’t a pay-per-view star, even though he’s a very good fighter with great talent. Khan, 31, hasn’t been a top fighter in boxing since at least 2012. Khan’s career tanked in 2012 after he suffered a second consecutive loss. If Arum made the Crawford vs. Khan fight in 2011, before Amir was beaten in back to back fights by Lamont Peterson and Danny Garcia, then this fight would be seen as a much interesting match-up by the American boxing fans. But the way things are now, Arum has matched Crawford against a fighter that is faded and forgotten in Amir Khan. Someone from Top Rank should let Arum know that Khan is no longer relevant at welterweight, and he’s just a guy that travels a lot, and does a lot of social media posts. Khan stopped fighting good opposition after he was knocked out by Canelo. Khan disappeared for 2 years from the sport, and then came back and beat two tuneup fighters in Phil Lo Greco and Samuel Vargas. Khan was supposed to fight Kell Brook after those 2 tuneups, but he decided he wanted the Crawford fight. Since the boxing public already knows the outcome of the Khan vs. Crawford fight, they’re not likely to want to order this match. Khan (33-4, 20 KOs) is trying to revive his career, but he looks like a washed up fighter at this point. Heavyweights are able to come back after being out of the ring for a long time, but not welterweights. They don’t do well in being out of action for extended periods of time unless their name is Floyd Mayweather Jr. It doesn’t help that the fans see Khan as cashing out with his fights against Crawford and Kell Brook. Many of them believe Khan will retire after those two fights, after he loses both of them. If Khan doesn’t retire, he might as well, because he’s not going to get lucky getting a title shot the way Adrien Broner lucked out in being selected by Premier Boxing Champions to challenge WBA ‘regular’ welterweight champion Manny Pacquiao for his title tonight on SHOWTIME PPV. Khan vs. Crawford might do really poor numbers on ESPN PPV like the Terence vs. Viktor Postol fight did in 2016. That fight pulled in just a little over 50,000 PPV buys on HBO. That wasn’t that long ago. When you see a fighter bringing in only 50,000 buys less than three years ago, it makes no sense to predict for him to bring in over 1 million buys fighting a washed up fighter who has only fought twice since making a comeback. Crawford-Khan would have been better if Arum stuck it on regular ESPN. At least the casual boxing fans would watch it, and it would ultimately help Crawford’s popularity if he looked good. « Can Oscar Rivas become a top 10 heavyweight?